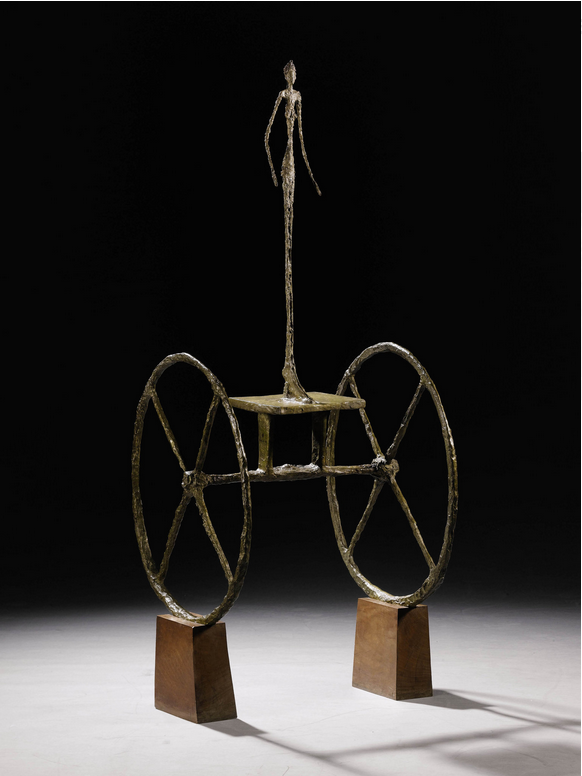 Sotheby’s salesroom went dead quiet on Tuesday night, the audience visibly at the edge of their seats when Giacometti’s “Chariot,” a 1950 bronze of an elongated female, came on the block at the Impressionist and Modern evening sale, the opening to the fall season. The provenance of “Chariot” was pristine; it was being sold by Alexander Goulandris, a member of the Greek shipping family, and the sculpture was among the artist’s rarest. So when there was a lone bidder willing to pay nearly $101 million, it felt like a disappointment. “They’re pushing prices and eliminating 99 percent of their audience,” Robert Landau, the Montreal art dealer, said. Perhaps. But Sotheby’s still managed to sell $422.1 million worth of Impressionist and Modern art, just $1 million shy of its $423.1 million high estimate. It was the company’s highest total ever, with strong prices achieved for masters including Modigliani, van Gogh and Monet. The sale was the first of the important two weeks of back-to-back auctions, where a total of some $1.6 billion worth of art is up for grabs and because of the high prices of auctions just months ago, expectations ran high. But of the 73 works Sotheby’s had on offer, 15 failed to sell. “Chariot” was not the only goddess looking for a buyer. Three bidders went for Modigliani’s “Tête,” created in 1911-12. While the sculpture was expected to sell for around $45 million, its estimate encouraged rather than scared off collectors. Three ended up bidding, and the “Tête” sold to an unidentified telephone bidder for $70.7 million. Carved from a single block of limestone, chisel marks apparent against its smooth finish, the work depicts a goddess with an elongated nose, blank eyes and curly hair inspired by ancient sculptures. It is one of 25 heads that Modigliani is thought to have carved. In June 2010, another “Tête,” created around the same time, sold at Christie’s in Paris for $52.6 million (nearly $57 million, adjusted for inflation), although the Sotheby’s work is larger. Sotheby’s had a lot invested in the results of the two sculptures. The auction house was so convinced that they would sell for big money that it guaranteed both works, meaning the company had promised the sellers an undisclosed sum regardless of the outcome of the auction. Collectors in Asia were active by telephone. A Sotheby’s representative, Jen Hua, based in Beijing, took the winning bid for van Gogh’s “Still Life, Vase With Daisies and Poppies” from 1890. It was expected to sell for $30 million to $50 million and brought $61.7 million, a high price considering that the painting had been on the market privately with an asking price of $40 million to $45 million, according to several dealers who were approached. Pretty, richly colored Impressionist paintings still have a certain allure, especially among today’s newer buyers. Among the most popular of the trio was “Alice Hoschedé au Jardin,” an 1881 canvas showing the artist’s 37-year-old lover in a white dress doing needlework under the shade of a tree. Estimated to fetch $25 million to $35 million, it went for $33.7 million. Four bidders pursued the work, which ended up selling to Charles Moffett, a vice chairman of Impressionist and Modern art at Sotheby’s, on behalf of a telephone bidder. The artist’s “Sous Les Peupliers,” a sun-dappled 1887 landscape of Monet’s beloved French countryside, expected to sell for $12 million to $18 million but brought $20.3 million from an unidentified telephone client. “Everybody was expecting more,” he said. “But it’s still a fantastic price.